I love being an Aunt and I’m fortunate enough to have three gorgeous nephews who I can return after a few hours of babysitting! I previously wrote about my eldest nephew when I did a post on making sushi rolls a few years ago. 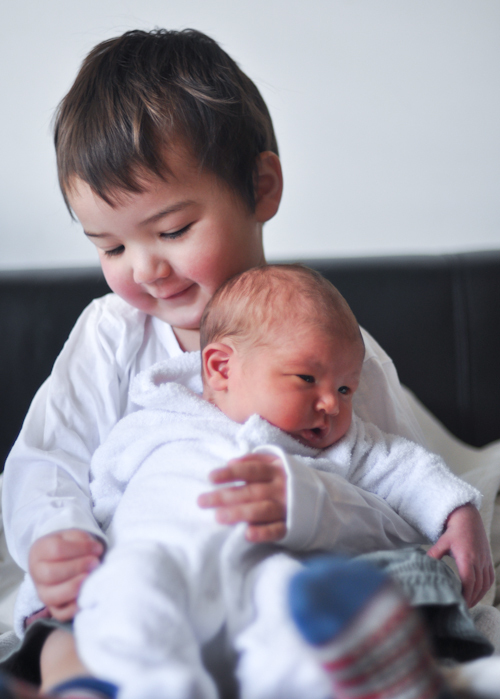 Since then, two other little boys, James and William, have come into our family. Its fascinating to watch James handle his little brother. I still remember the first time James laid eyes on William. He came into the maternity room with his father, looked at the little bundle, then looked at his Mum, and then back to his brother and then to his Mum again as if to say “what have you done?!? !” Luckily he quickly warmed up to William, constantly trying to give him a cuddle and kiss. It should be loads of fun to watch them grow up together but I suspect though that James will find a way to put the blame on William for any mischief them may get into. When I ask him “who is naughty?”, James loves to say, “bro-da”! One of James’ favourite food is spaghetti. He also has a penchant for anything sweet (like his Mum). I suspect James would love Filipino Style Spaghetti which was the Kulinarya Club’s dish for the month of October. Purists out there need not read any further as the recipe below is enough to give any Italian grandmother a heart attack. 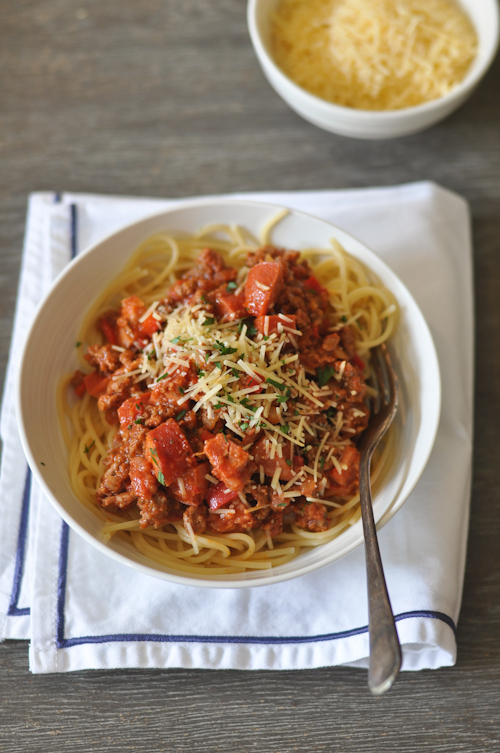 Filipinos have taken the traditional bolognese recipe and put their own twist to it. So what makes it so different? A few things come to mind. First, the sauce is sweetened by the addition of sugar and some recipes will also include ketchup (banana or tomato) Second, is the that the recipe includes chopped hotdogs. The recipe is not going to win any awards for traditional cuisine but kids love it! In fact, it’s so popular that it’s become a staple in children’s parties and even Mc Donalds in the Philippines have created their own version called the Mc Spaghetti. So here is my recipe. I have to admit that I couldn’t bring myself to use ketchup in this recipe but otherwise, it’s pretty much how I remember it tasting. A little quirky, but every little bit of it delicious. Heat the oil in a large pot and add the onions and garlic. Saute over low heat for around 5 minutes until the onions turn translucent. Add the red peppers and again saute until softened, around 5 to 10 minutes. Add the beef and cook over medium high heat until cooked then add the chopped hot dogs and the tomato paste. At this point, season with salt and pepper and add the sugar. Stir the mixture well and add the tomato sauce. Allow to cook for around 15 minutes over a low heat. In the meantime, prepare the pasta as per directions on the packet. Drain the water from the pasta. 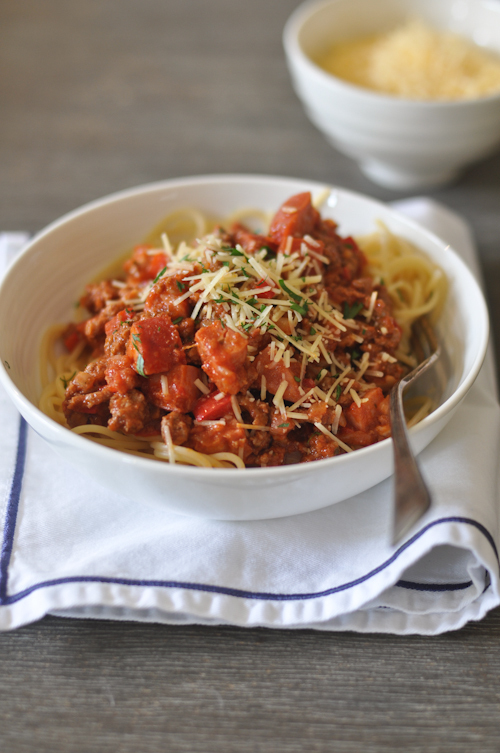 When the sauce and pasta is done, spoon the sauce over the spaghetti noodles. I’m so glad I found this on foodgawker! I haven’t had Filipino style spaghetti since I first started piano lessons as a child. My piano teacher’s wife made this spaghetti a few times and I remember it being the best spaghetti I’ve ever had. I can’t wait to try this recipe out! Lovely photos! Your spaghetti looks really delicious! Oh gosh, those two boys are adorable! I’m happy that they love this version of Spaghetti! Trissa, your nephews are indeed GORGEOUS. I hope they grow up to love Filipino spaghetti because it is so great. Your spaghetti looks so good!!! That looks really yum! I always pour a lot of sauce on my serving. And your nephews look adorable!